A move to Finland where she learned Finnish sign language helped Ida Rogers – head teacher at Deaf Society NSW – become a better teacher. Auslan is Ida Rogers’ first language so she decided that if she was going to empathise with her Auslan students, she’d better learn a new language herself. So she moved to Finland and learned Finnish sign language. are signing correctly. Each sign involves hand shapes, orientation, location, movement, and facial expression. There’s a lot for students to learn and one small change in hand movement or facial expression can result in embarrassing gaffes. 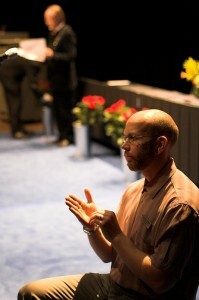 Accredited Auslan courses include a Diploma in Interpreting. 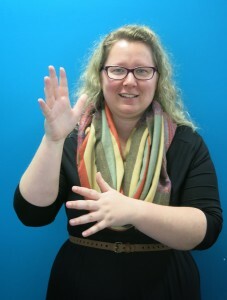 Teaching Auslan and educating people about deaf culture improves opportunities for deaf people to gain fulfilling work, get better access to information and achieve equal standing in society. Beyond the beginners Auslan courses of Sign Language 1 and 2, students can progress through to the accredited courses. Certificate II to the Diploma of Auslan are generally completed over two to three years, then it is the Diploma of Interpreting for those interested in becoming an interpreter. Laura Lawrence is already fluent in three languages. Now she’s picked up a fourth. She’s studying beginners’ Auslan with her husband and two friends on Saturday mornings at the Deaf Society’s Parramatta campus. ‘I expected the Auslan class to be interesting but I didn’t expect it to be so much fun,’ Laura says. The Deaf Society runs around 90 face to face Auslan courses each year across New South Wales from beginners to the Diploma of Auslan as well as offering online Auslan classes at Sign Online.